I have to introduce my debut newspaper article by admitting that I cannot pronounce the name of this dish, Paupiettes du Boeuf. However, I take solace in the fact that Nancy Stohs, the food editor for the Milwaukee Journal Sentinel, cannot either. You can find my article, as well as more pictures of the process and fellow blogger’s tales on the Milwaukee Journal Sentinel’s website atwww.jsonline.com/food. The stuffing of pork, veal, and herbs was a snap, after I visited most of the grocery stores in Milwaukee for ground veal. The next step was stuffing the pounded slices of beef, which seemed simple enough. However, when the rolls hit the heat, the meat shrank and the toothpicks I used to secure them were not holding; I should have used string as Julia had directed. My amazing husband Todd came to the rescue: he had asked a butcher for some string on the sly. He triumphantly handed it over, and we began to tie the remaining paupiettes. What a breeze they were to sauté, and decidedly more attractive. The remaining steps were equally straightforward – add it all into the pan, and braise it at 325 degrees for about an hour and a half. Well. I am once again reminded that straightforward does not equal uncomplicated. I suppose this is the part where I confess: I do not use the oven very often, and it shows. Needed equipment: 3-quart mixing bowl, wooden spoon, white string, a heavy fireproof casserole about 10 inches in diameter and 2 ½ to 3 inches deep, bulb baster, wire whip. Cook onions slowly in butter 7 to 8 minutes, until they are tender, but not browned. Scrape into mixing bowl. Add pork, veal, pork fat, garlic, thyme, allspice, pepper, the ¼ teaspoon salt, the chopped parsley and egg. Beat vigorously with wooden spoon until thoroughly mixed. Flatten each slice of beef to a thickness of 1/8 inch by pounding between two sheets of wax paper with a wooden mallet or rolling pin. Lay meat flat on a board and sprinkle lightly with salt and pepper. Divide the meat stuffing into 18 portions and place one on the lower third of each slice. Roll meat around stuffing to form cylinders about 4 inches long and 1 ½ inches thick. Secure each with 2 ties of string. Dry with paper towels. Heat rendered pork fat or oil in heavy casserole until almost smoking. Brown paupiettes lightly, a few at a time, and remove to a side dish. Reduce heat to medium and brown vegetables slowly 4 to 5 minutes, stirring. Then add flour and brown it slowly 2 to 3 minutes. Remove casserole from heat and immediately beat in wine, then stock or bouillon. Lay rind in bottom of casserole. Place paupiettes over it, and add more stock or bouillon, or water, if necessary to the liquid so paupiettes are barely covered. Add herb bouquet. Bring to a simmer on top of stove. Cover casserole and set in lower third of preheated oven. Regulate the heat so the paupiettes simmer very slowly 1 ½ hours. Baste them two or three times with liquid in casserole. Remove paupiettes to a side dish and cut off trussing strings. Strain cooking liquid into a saucepan and degrease thoroughly. Boil down sauce if necessary, to concentrate its flavor. You should have 1 ½ to 2 cups thick enough to coat a spoon lightly. Correct seasoning. Off heat, beat mustard and cream into sauce. Simmer 1 minute. Rearrange paupiettes in casserole or a fireproof serving dish, and pour sauce over them. About 10 minutes before serving, reheat barely to a simmer on top of stove. Cover and simmer slowly 5 minutes or so, basting paupiettes frequently with sauce. 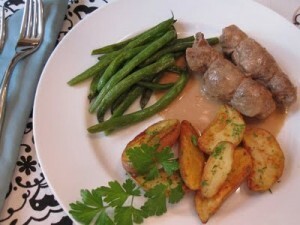 Serve from the casserole, or arrange paupiettes on a platter, spoon sauce over them and surround with rice or noodles. Decorate with parsley sprigs. P.S. I finally found the ground veal at Sendick’s.